Over Tamriel Rebuilt's long history, several creatures have been removed from the project's data files, usually due to lack of quality or animation errors. This page goes over permanently removed creatures as well as creatures who have had their models revised. These huge flapping fiends flew silently and attacked from above, often surprising the unwary. 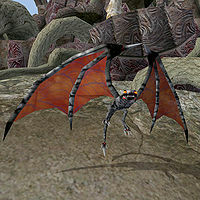 Bat Creatures were removed from the Sacred East release mostly because of problems related to how the engine handles flying creatures colliding with static objects (they fall through the floor of the interior or through the static object upon death, making them unable to be looted.) The creatures were also disliked by a large majority of the development team due to the concept being a bit cliche. The files for bat creatures are still in Tamriel Rebuilt's data, however, and the alchemical ingredient they used to carry is still sold by some merchants. 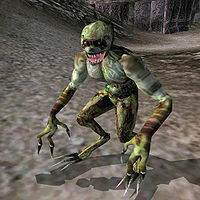 Esurio Viridis was a stationary plant enemy that appeared in Tamriel Rebuilt's Telvannis release. Bugs related to its animations and the odd behavior of not wanting to attack back, even when attacked, ultimately caused Esurio Viridis to be dropped in later versions of Tamriel Rebuilt. Sea Crabs are a variety of crustacean. They are hostile and can be found in many locations across the mainland's beaches and oceans. They have a habit of triggering battle music and being very hard to find at the same time. This is mainly because they can travel between land and water. 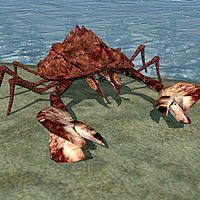 Note that a newer version of the Sea Crab still exists in data. 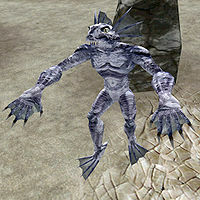 Sea Trolls were completely water based and became hostile when they found a target in the water. The older version of the Swamp Troll hopped forward at the target on its hind legs. 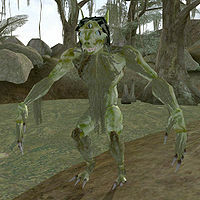 Note that a newer version of the Swamp Troll was created to replace the previous version, and still exists in Tamriel Rebuilt's data files. These Daedra are only slightly intelligent and will attack on sight. They have often served Mehrunes Dagon. Note that a newer version of the Vermai still exists in Tamriel Rebuilt's data files.